Night sky watcher Vaibhav Tripathi took this photo of a Perseid meteor from the Santa Cruz Mountains near Palo Alto, Calif. on August 12, 2012. Get ready to start looking up this summer. 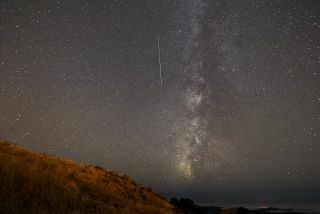 For Northern Hemisphere observers, the latter half of July on into August is usually regarded as "meteor viewing season," with one of the best displays of the year reaching its peak in mid-August. This week, however, let's concentrate on some of the lesser-known summer meteor displays. In general, Earth encounters richer meteoric activity during the second half of the year, and stargazers are more likely to see twice as many meteors per hour in the predawn hours as compared with the evening hours. During the premidnight hours, the United States is on the "trailing" side of the Earth due to our orbital motion through space. Any meteoric particle generally must have an orbital velocity greater than that of the Earth to "catch" the planet. After midnight, when the United States is turned onto the Earth's "leading" side, any particle that lies along the Earth's orbital path will enter the planet's atmosphere as a meteor. As such, objects collide with the atmosphere at speeds of 7 to 45 miles per second (11 to 17.7 kilometers per second), their energy of motion rapidly dissipates in the form of heat, light, and ionization, creating short-lived streaks of light popularly referred to as "shooting stars." Summertime meteors, occasionally flitting across your line of sight, are especially noticeable between mid-July and the third week of August. Between Aug. 3 and 15, there are no fewer than six different active minor displays. These six meteor showers are listed in the table below. These minor meteor showers of the summer season might not dazzle like the biggest showers of the year, but they still put on a shower. The actual number of meteors a single observer can see in an hour depends strongly on sky conditions, but the only equipment you'll need to see them are your eyes and a modest amount of patience. The rates given in the table are based on a limited star magnitude of +6.5 (considered to be the faintest star visible to the naked eye without the use of binoculars or a telescope), an experienced observer, and an assumption that the radiant is directly overhead. The radiant is the place in the sky where the paths of meteors, if extended backward, would intersect when plotted on a star chart. Your clenched fist held at arm's length is equal to roughly 10 degrees on the sky. So if the radiant is 30 degrees ("three-fists") above the horizon, the hourly rate is halved; at 15 degrees, it is one-third. While the hourly rates from these other meteor streams provide but a fraction of the numbers produced by the Perseids, combined, overall they provide a wide variety of meteors of differing colors, speeds and trajectories. Among these are the southern Delta Aquarids, which can produce faint, medium-speed meteors; the Alpha Capricornids, described as bright yellowish meteors and the Kappa Cygnids, which sometimes produce fireballs. As such, if you stay out and watch long enough, you may be nicely rewarded for your time spent. Note that five of the six showers listed come from the region around the constellations of Aquarius and Capricornus. These constellations are highest in the southern sky between roughly 1 a. m. and 3 a.m. Eastern time. The Kappa Cygnids appear to emanate from the constellation Cygnus, which will appear more or less overhead within an hour of local midnight. Currently, the one drawback in watching for meteors is a bright gibbous moon, which this weekend will wane to last quarter on Sunday. As Robert Lunsford of the American Meteor Society points out, "the waning gibbous moon will rise later during the evening hours, but will still be in the sky during the more active morning hours, causing considerable interference with meteor viewing." After Sunday, the moon will diminish to a crescent phase, continuing to wane in both phase and brightness and will become significantly less of a hindrance to viewers as well as rising progressively later in the night. It will be new on Aug. 5.